Years ago, one of my very first genealogical finds was a biographical entry for Frank Kamp in a Washington County, Pennsylvania history. It offered amazing details on the Kamp family, but, unexpectedly, the Hopper family. A new surname in my research! The Hopper’s linked to Frank Kamp’s wife, Mary Hanna, and her grandfather was James Hopper. Born in County Derry, Ireland, in 1788, James Hopper immigrated to the United States with his wife and children in June 1849, first settling in Pittsburgh, Pennsylvania before moving south to Peters Township in Washington County shortly thereafter. Over the years, his Washington County farm expanded to 135 acres, and James died in 1885 at the youthful age of 97. 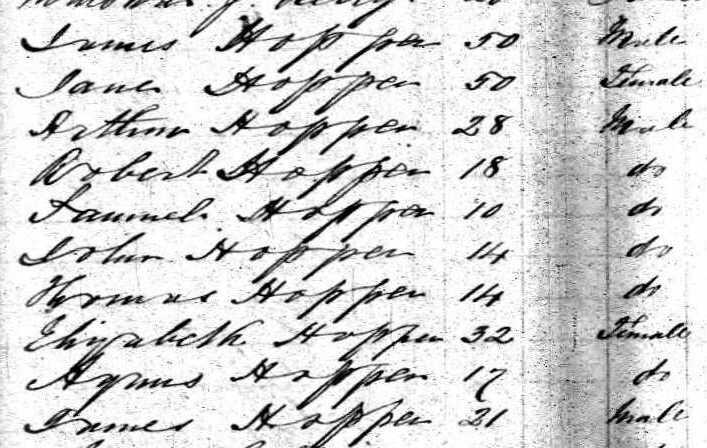 Above is the passenger list for the Hopper family, arriving at New York from Liverpool aboard the Ashburton on 30 June 1849. The family’s ages are a bit fluid, but this is clearly the correct family. For a rookie genealogist, as I was at the time, the biographical entry in the Washington County history was simply overwhelming; it included birth and death information for James Hopper’s wife and 9 children, the county of origin in Ireland, the family’s year of immigration to the United States, details on the homestead in Peters Township, church affiliation, even the delightful comment that Hopper’s mother had once been the oldest woman in Ireland on record. Yet in my initial excitement, I missed perhaps the most critical piece of information: the historical context. 1849, the year that the Hopper’s emigrated to the United States, was no ordinary year in the history of Ireland. Already in full destructive force, the Great Famine traced back to the failure of the potato crop in 1845. With the population so dependent on the one crop, and coupled with the ineffective response from the British government, the situation soon became cataclysmic. As a result of the Great Famine, Ireland’s population dropped more than 20%, a staggering statistic; more than 1 million people died, and nearly 1 million more left the country, many emigrating to the United States. My family was among those that traveled to America, what a compelling and equally tragic story. I’ve barely scratched the surface of my research on the Hopper family in County Derry. I’d like to learn more about the local conditions before, during, and after the Famine, how many other families from the area emigrated, and how long the Hopper’s had lived there before departing for the United States. With a trip to Salt Lake City planned for next year, my research agenda will most definitely continue to grow.